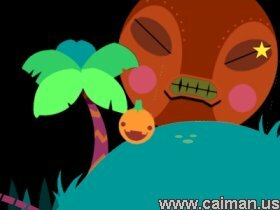 Caiman free games: Roly Poly Pumpkin and the Totem of Mystery by Adam Lobacz. A charming Halloween platformer for dreamers. 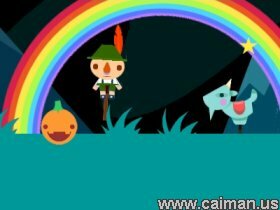 As a pumpkin you must roll left or right and jump around over hills to unlock new events. As you unlock certain events, you will in turn unlock one of the four pieces of totem pole in the game. Complete the Totem Pole and technically the game is finished, but there are one or two surprises for afterwards. Oddly enough, I find it pleasing to admit that this has instantly become one of my favourite games of all time; and I've played through plenty. The music is absolutely enchanting, the graphics are beautiful and glorious, the characters are adorable and astounding and the game itself is just truly amazing. This is one game that has literally no flaws, except that a little more would of been much appreciated. This game is just truly extraordinary down to the last detail. The game should be of a cult-like status and we need more games like this from you. I very much hope that we get another game in this style from you one day, whether it be a direct sequel or something completely new. Either way, this is a classic and you need Johan Hargne's music to be incorporated in your next game, too.